Angela is an older woman who unfortunately several years ago was diagnosed with multiple sclerosis. She suddenly became weaker and was having trouble walking, shortly after developing some cold symptoms and a cough. When she went to the ER, she was found on Xray to have evidence of pneumonia. I’ve had two patients in the office this week with pneumonia and found myself having to explain exactly what that meant. We’ve got tons of folks right now with cough and respiratory congestion, and the majority don’t have pneumonia. What IS pneumonia, anyway? 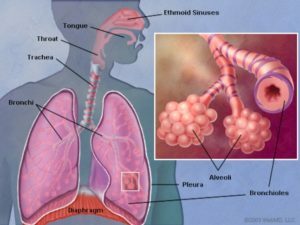 To help you understand what pneumonia is and why it is so dangerous, we have to start with knowing the different parts of the lung and how they work. When you take a deep breath, the air goes into your nose or mouth, down your throat, between the vocal folds (or vocal cords) and into the trachea. This is an enormous airway that you can feel below the Adam’s apple in the front of your neck just below the skin. It’s got ridges because of rings of cartilage that make sure the trachea stays wide open. From the trachea, the airway divides into left and right main stem bronchi, the main airways leading to the left and right lungs. The bronchi divide into smaller and smaller airways like the branches of a tree until they reach the alveoli. Here is a really excellent diagram I found on WebMD (they own the copyright, so kudos to them!) that you can use to visualize these different parts. Croup, or tracheobronchitis, affects the largest airways, the trachea and mainstem bronchi. It causes a very hoarse voice, horrible sore throat, dry painful “barking” cough and fever. In children with small airways it can cause a high-pitched noise called stridor when they breathe. Usually the symptoms are worst at night, especially in children. Croup is so scary! My son had it twice when he was small, and we were in the ER both times. I’m a doctor, I KNEW what it was, and it was still scary! Bronchitis is very common, and is usually caused by a cold virus. This affects the bronchi inside the lungs themselves and causes a “rumbling” sound called rhonchi when breathing, a (usually) moist productive cough and can have associated cold symptoms like runny nose and congestion. Bronchiolitis is a specific form of bronchitis that attacks the very smallest airways right before the alveoli. Its most common cause is a virus called respiratory syncytial virus (RSV) that can be very dangerous for small babies. For older children and adults it causes a cold or bronchitis, but small babies can get very sick and need hospitalization with wheezing and trouble breathing with this illness. Pneumonia is an infection in the alveoli. The alveoli are the sacs where carbon dioxide is released and oxygen is absorbed by the blood. The are extremely delicate and can be badly damaged and scarred by infection. 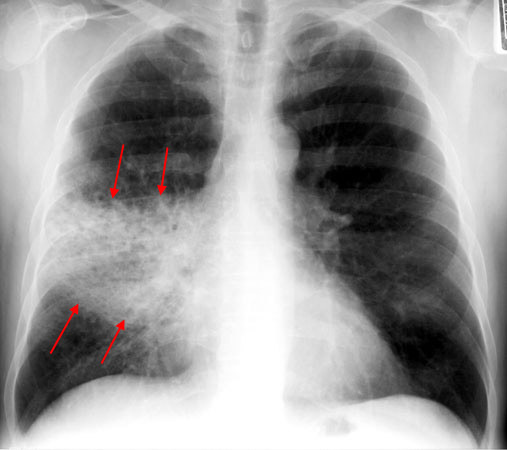 We can often see evidence of pneumonia on Xray because larger areas of the lung can be infected. Symptoms of pneumonia include cough, chest pain with breathing, fever, shortness of breath and generally feeling unwell. If the part of the lung that exchanges carbon dioxide and oxygen is full of pus and not functioning, the body can have trouble getting enough oxygen. This can be very dangerous, especially in people who don’t have good lung function to start with (like asthmatics and people with COPD), those whose immune systems aren’t normal (like Angela with her MS, or like my diabetic patients) and those who are very young or very old. Pneumonia is the number-8 leading cause of death in the US (with influenza). Preventing pneumonia starts with good handwashing and includes staying generally as healthy as one possibly can. Getting plenty of rest, eating healthy and taking a good quality multivitamin, exercising and managing your stress are integral to maintaining a strong immune system. Vaccination against influenza and Streptococcus pneumoniae (the cause of the most dangerous form of pneumonia) decrease your risk as well. We haven’t even started in to cold and flu season and I’m already seeing cases of pneumonia. With the Farmer’s Almanac forecasting a long, cold, snowy winter we’d better start now to reduce our risk of pneumonia this season. QUESTION: Have you had pneumonia? yes and I’m feeling a little better with the prednisone. Yes and I agree it’s terrible. Came down with it in the beginning of July several years back and struggled with it until mid September until I finally felt much better. It was a struggle. Thanks Dr Jen, I guess I’ll be scheduling my appointment for shots as soon as I get over this bronchitis. The prednisone is working its magic, as always, I’m free of all my pains, even though my lungs are bogged down with ronchi sounds See you on Friday morning!